Arena LDC emerges; why would it be used to pay for infrastructure for broader AY project? Even as the Atlantic Yards project seems stalled, state officials have organized a local development corporation (LDC) to oversee tax-exempt bond financing for Forest City Ratner’s planned Barclays Center arena. But the odd thing about the Brooklyn Arena Local Development Corporation (BALDC) is that its scope contemplates financing for infrastructure improvements beyond the arena—a function not mentioned in the Atlantic Yards General Project Plan (GPP). That could help get the city and state off the hook for providing additional infrastructure while allowing Forest City Ratner favorable terms to pay for the infrastructure. Keep in mind that the GPP (excerpt at right) budgets $544.4 million on project infrastructure, while, as of now, $205 million would come from government funds, with no particular source for the rest. As the project approached approval in December 2006 by the Empire State Development Corporation (ESDC), no one--as far as I know--raised questions about full funding for infrastructure. And while the LDC appears to provide a vehicle for Forest City Ratner to pay for that infrastructure, other language in project documents opens up the possibility of additional governmental contributions. The above analysis is preliminary, because the ESDC would provide only partial answers to my queries and was unwilling to explain whether such infrastructure financing was contemplated in the GPP. News of the LDC emerged via State Senator Velmanette Montgomery, who posed questions to Forrest Taylor, the ESDC’s Atlantic Yards ombudsman. Taylor explained that BALDC, which would raise funds via tax-exempt and taxable bonds, was formed pursuant to the New York State not-for-profit law on 11/6/08. While the BALDC is not ready to sell such bonds, such bonds must be issued by the end of 2009 to qualify under grandfathered-in Treasury Department regulations. However, the BALDC is not a subsidiary of either agency; rather, the structure is similar to that of the Liberty Bonds Development Corporation. Its role, according to Taylor, will be limited to the financing of arena bonds and possibly the financing of project infrastructure. Project decisions will be made by ESDC. Neither the State, ESDC or JDA will have any obligations to the bondholders. No bond sale would occur until ESDC acquires the site by condemnation—and while ESDC targets 2009, that likely depends on lawsuits. 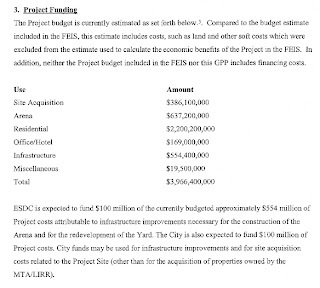 As I wrote last April, some language on p. 27 of the GPP hints at future government reimbursement to the developer. In addition, Additional Fundings shall be made taking into account monies expended by FCRC, provided that (1) at no time will (i) the costs reimbursed to FCRC by the City and State, in the aggregate, exceed fifty percent (50%) of the total costs incurred and paid by FCRC, and (ii) the amounts funded by the State exceed the amounts funded by the City, and (2) such Additional Fundings shall be made upon other terms and conditions to be agreed upon by the parties. In other words, the term "Additional Fundings" is first used as a definition for pledged contributions, then used as a definition for further new contributions. I had commented that the money might go to "extraordinary infrastructure"--an undefined term that I thought pointed to the railyard--but now that looks more open. Develop Don't Destroy Brooklyn (DDDB) in 2005 belew the whistle on the "extraordinary infrastructure costs," pointing out that the term appears in the Atlantic Yards Memorandum of Understanding (MOU) signed by the city and state, leaving room for further reimbursement by public parties. I asked Johnston if the infrastructure financing would be limited to the arena. “It is envisioned that the Infrastructure financing will be for the project as a whole (certain parcels - including the arena parcel - may be excluded),” he replied. Was it in the GPP? As far as I can tell, no. In the case of the Arena site, ESDC would lease the land for $1.00 to a Local Development Corporation ("LDC") organized under Article 14 of the Not-for-Profit Corporations Law. Subject to compliance with applicable Internal Revenue Service regulations, the LDC, which is expected to be organized at the direction of ESDC, will issue one or more series of tax-exempt "PILOT" bonds to pay the costs of constructing and fitting-out the Arena and its ancillary facilities.2 An FCRC affiliate ("ArenaCo"), as agent for the LDC, will use the bond proceeds to construct and fit out the Arena. The LDC will lease the land and Arena to ArenaCo, and ArenaCo will agree to maintain, operate and lease the Arena for professional basketball and other sports, entertainment and community events for an initial term of not less than 30 years and not more than 40 years. Certain costs of constructing the Arena will be financed through issuance by the LDC of taxable bonds; debt service on these bonds will be paid by assignment to the bond trustee of rent to be paid by ArenaCo under its lease from the LDC. ESDC will retain ownership of the land under the Arena through the initial term of its lease to the LDC, and, under the financing arrangements described above, ESDC or the LDC will retain ownership of the Arena during the initial term. As a result, the land and improvements will be exempt from real estate taxes throughout the initial term. ArenaCo would enter into a payment-in-lieu-of-tax ("PILOT") agreement with ESDC and the LDC under which it would agree to make payments not to exceed the amount that full real estate taxes would be if the land and improvements were not exempt from such taxes as a result of ESDC's ownership thereof. ESDC will assign these PILOT payments to a PILOT trustee who, in turn, will assign to a bond trustee so much of the payments as is needed to pay debt service on the tax-exempt bonds. PILOT bonds will be payable solely out of PILOT payments by ArenaCo. Excess PILOT payments during the life of the bonds would be used to defray the cost of operating and maintaining the Arena. It is expected that ArenaCo's obligations under the PILOT agreement will be secured by PILOT mortgages on its leasehold interest; the taxable bonds will also be secured by a mortgage on the leasehold. None of the City, the State or ESDC will be liable on the LDC bonds which will be non-recourse obligations of the LDC, payable solely out of PILOT payments from ArenaCo. None of the City, the State, ESDC or the LDC will be liable to make PILOT payments. PILOT payments under the PILOT Agreement will be the sole obligation of ArenaCo. Johnston explained that PILOTs would not be used for infrastructure: “The LDC arena bond financing is distinct from the proposed LDC infrastructure bond financing. A ‘development fee’ (similar to a rental payment) will be the source of repayment of the infrastructure bonds." ESDC (directly or through a special purpose subsidiary) will hold fee title to the Project properties acquired by it, at least through construction of the improvements on these properties. The 73 tax lots to be acquired by ESDC will be subdivided and/or combined, at the sole expense of FCRC, to create the individual development parcels contemplated in the plan for the Project. It is expected that each development parcel will comprise an individual tax lot which, except for the Arena parcel, will be leased back to a special purpose FCRC developer affiliate for $1.00. --whether this model has been used in other projects. “At this point, all I can tell you is that the proposed infrastructure financing structure has not been finalized," Johnston responded. "If and when it is - we will address further questions on this topic." There's no mention of infrastructure funding in Chapter 11, Infrastructure, of the FEIS, nor in Chapter 0, Executive Summary. FCRC shall be required to remit payments in lieu of sales taxes to ESDC under the lease or access agreement for each portion of the Project Site equal to all sales and compensating use taxes, if any, which FCRC would have been required to pay in connection with the development of such portion of the Project Site absent ESDC's ownership thereof, other than the Arena Sales Tax Exemption. After completion of construction, the fee interest to each development parcel will be conveyed for $1.00 to the development entity established for that parcel. That looks like PILOTs of a different kind--in lieu of sales taxes, not real estate taxes--but directed to ESDC, not to bondholders. According to the ESDC web site: Empire State Development is the parent organization for New York’s two principal economic development financing entities: the Empire State Development Corporation (formerly known as the Urban Development Corporation), and the Job Development Authority. In 1995, these agencies, which had previously functioned independently, were consolidated in order to increase efficiency, reduce overhead and enhance the delivery of the State’s economic development initiatives. Reorganized as Empire State Development, the combined agencies now function as a streamlined economic development organization whose primary mission is the facilitation of business growth and job creation across New York State. As part of this economic development role, Empire State Development Corporation oversees the issuance of debt under the programs of both the Urban Development Corporation and the Job Development Authority. On the UDC side, bonding programs include Corporate Purpose, Correctional and Youth Facilities, Sports Stadium Assistance, and various educational and civic related project revenue bonds. The Job Development Authority issues both taxable and tax exempt bonds to finance its business lending programs. These programs are designed to promote job growth by providing loans to assist New York companies to build and expand facilities and acquire machinery and equipment. I can't talk to the additional infrastructure point. "Oversee" is probably a strong word for the new LDC's role. It's a cipher, an issuing vehicle for the arena bonds, because IRS regulations mandate a non-profit public issuer. I'm not quite sure why the existing city and state LDCs are not appropriate for the task. I could irresponsably speculate that they don't want their ratings harmed by the AY albatross, but I don't think that's the reason. There is currently a $825+ Billion stimulus package being debated in Washington with Democrats wanting as much infrastrucure as possible to stimulate the economy via new jobs. 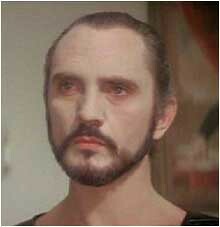 Its been bugging me all day to think that Ratner et al. can't get the Governor to include some funding for Atlantic Yards - maybe $200-400 million if its going to lead to 4 billion in additional stimulus in coming years. Caterpillar just laid off 20,000 people. These are the sort of projects that should be in the Stimulus package. Maybe we could start a petition or better get one of the local Congress people to lobby in the House. You want the federal government to help Ratner build an arena and luxury housing in a dead condo market? Glad you're not President. 4 billion in additional stimulus? what?